We’re Proud to Serve Durham, NC! 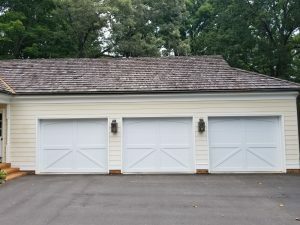 Garage Door Specialist owners and North Carolina natives Jimmy & Stephanie Davis have been proud to serve Durham and the surrounding area since 2002. We work with only the finest garage door technicians and parts in the industry – no compromises. Most of Garage Door Specialist’s expert team members in Durham have more than a decade of experience installing and repairing garage doors, giving us the most experienced team in the Triangle. Garage Door Specialist prides itself on fast garage door installation and thorough maintenance and repair offerings. If you need a new garage door to be installed or a broken garage door to be fixed in your Durham home, trust the experts at Garage Door Specialist to do it right the first time. Ready for your free, no-obligation home estimate in Durham? Give Garage Door Specialist a call at (919) 841-0030 or fill out an online contact form to schedule your consultation today!